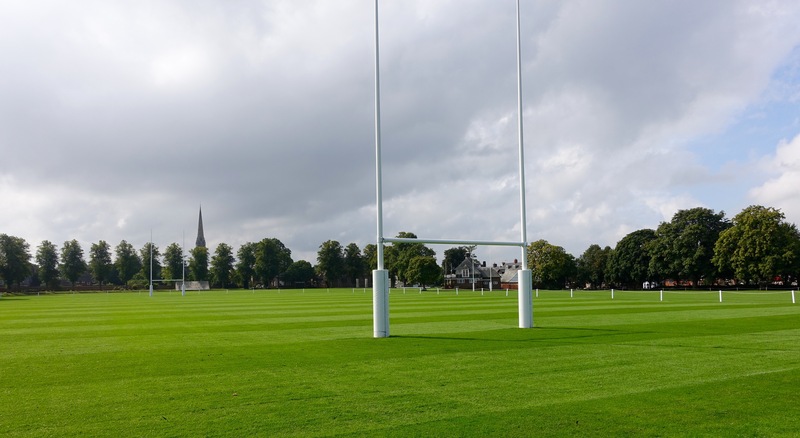 The Close at Rugby School, where the game began. Green compared the cherished tradition about the start of the game to an Old Testament story, something too good to fade away. Some would say that long before Ellis took the ball in hand “in a fine disregard of the rules,” others were carrying, not kicking, something in some kind of game. It might even go back, they say, to Roman times. My kind of chapel carving. But as Green pointed out, the rules of the modern game were first written down by students at Rugby School. The first games were played at The Close, an enclosure used for grazing. So players shared the field with sheep, which must have made for some nasty stains on their clothes (no uniforms back then; boys played in school togs). Green said the sides could be as many as 200 against 70 and the matches could last five days, although the rules in the 1880s cut that to three. 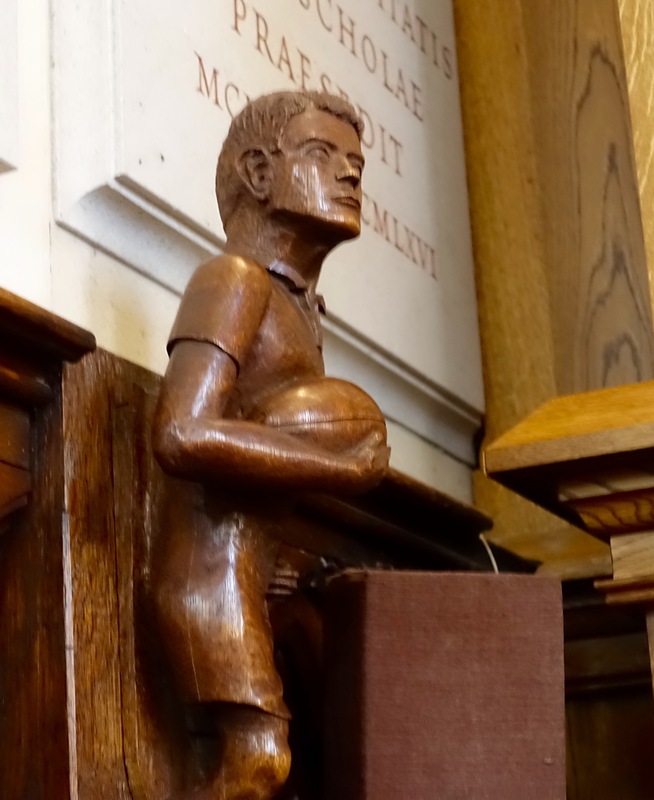 Rugby School was founded in 1567, moved to its present grounds in 1756 and Ellis — or someone — ran with the ball in 1823. The school now has 800 students aged 11 to 18 and admitted girls 40 years ago. But it does not have a women’s rugby team. 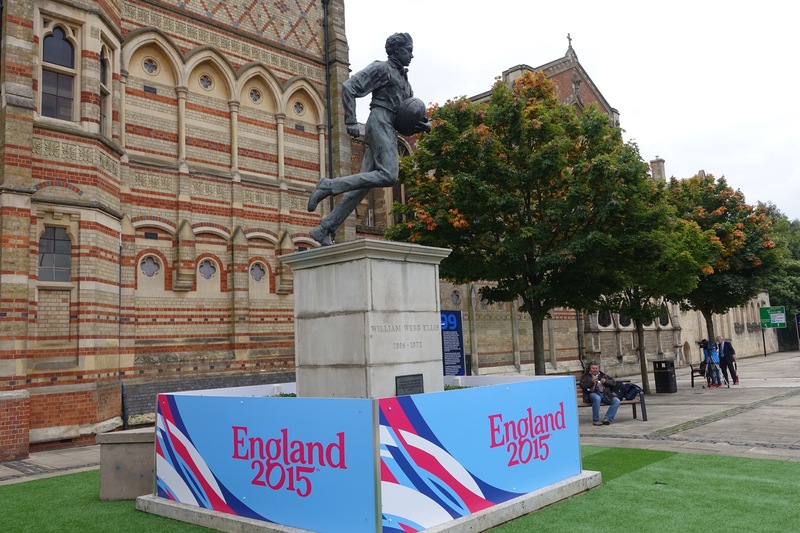 Statue in Rugby to William Webb Ellis. “We have girls keen to play,” Green said, “but there are no other schools playing women’s rugby. Previous Rugbeians have done just that. The game of rugby spread as former Rugby students, fellows or teachers became head master at other schools. Others carried the game out of Britain, including Richard Sykes, who some say brought the game to the United States and also established towns in North Dakota. Rupert Brooke and Matthew Arnold (his father, Thomas, is credited with introducing sports when he was head master at Rugby) are famous poets. Then I heard the class bell ringing at my back, and she was gone. 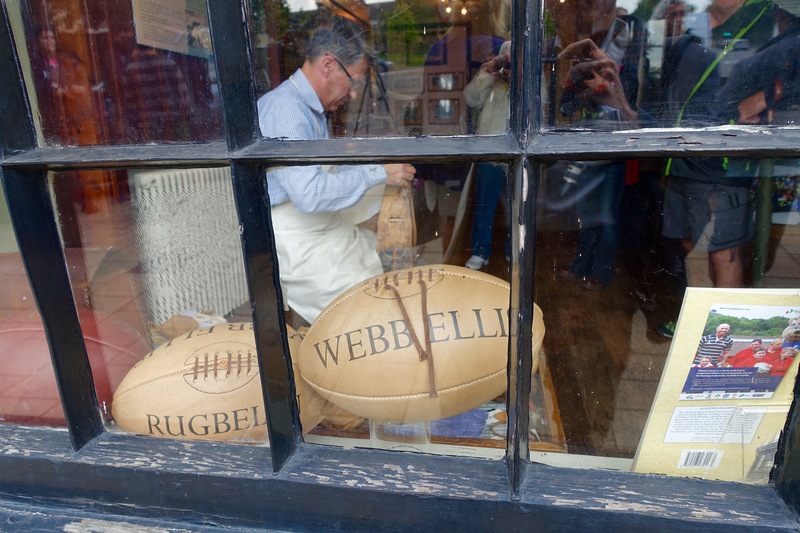 Peter Prince, a former shoe maker, stitches rugby balls at the William Webb Ellis Museum. Posted on September 17, 2015 October 15, 2015 by jbsaulPosted in RugbyTagged England Rugby 2015, Peter Green, rugby, Rugby School, Rugby World Cup. It is odd that this is still a debate. All great old schools in England had their own game, and still do. For Rugby it was football, what is now called Rugby Football. Harrow has, still, the Field Game, Eton the wall game, Eton and Rugby have a form of Fives (look it up) and there are plenty of others. Rugby Football as played now is just the school game that was took off best. The original rule book is still to be seen at the school, it’s quite a document. By the way, I enjoyed this article but you are wrong on Matthew Arnold ( a fine poet and Thomas’s son) on writing “To His Coy Mistress”. That I believe was Andrew Marvell.